The wedding we went to last month was in the Hunter Valley, a few hours drive from Sydney. So we drove up on Friday and stayed the Friday night before the wedding and the Saturday night afterwards, before heading home on Sunday. We stayed at Twin Trees Country Cottages, which was nice. The property had a small vineyard on it, and they make their own wine. We were given this bottle as a complimentary when we checked in. South Australia is better known for shiraz than is the Hunter Valley, plus this was a freebie, so I wasn’t expecting any great things from it. Although the 2001 vintage could be taken as a good sign, because (as far as my still rudimentary knowledge goes) shiraz tends to age well and improve as it gets older, so 9 years old should theoretically be better than a vintage from just 2 or 3 years ago. I’m also a bit reticent about shiraz as so far I’ve consistently found it to have a distinct “petrochemical” smell, which also translates across into the taste. Strong and a bit like (what I imagine it would be like) drinking kerosene. This one, however, was pleasant on the nose, without that sharp, pungent smell. I couldn’t pick anything particularly identifiable in the odour, but I noticed it didn’t smell like what I’ve come to think of as “typically shiraz”. And the taste was amazing. It was smooth and light, with a very distinct flavour of fresh raspberries. Totally not what I was expecting. After a bit of development in the mouth, the distinctive shiraz spiciness came through, though not with the power of some others I’ve tried. I was looking for black pepper, but it wasn’t that – it was more like cinnamon and aniseed. I have no idea if this would be considered a good shiraz or not, but I really liked it, which is a first for me and shiraz. We went out to Hugo’s at Manly (flash website) for dinner last night for my nephew’s birthday. My sister- and brother-in-law like shiraz, so this ended up being chosen from the wine list. The Wild Oats winery (more flash) is apparently run by the same people behind the Wild Oats yacht racing syndicate, which famously contests the Sydney to Hobart every year. 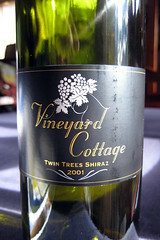 I was surprised to see a blend of shiraz and viognier. From my rudimentary experience, shiraz is a powerful, full-bodied, and very spicy red, while viognier produces tangy and florally aromatic whites. Of course mixing opposites sometimes produces amazing results. I don’t know if this was truly amazing, but a gold medal at a London wine show can’t be all that bad. 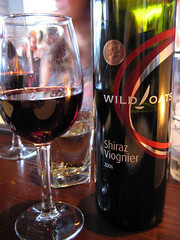 The spicy aroma of shiraz was muted and there was something else elusive and unidentifiable there. Complex and interesting, at any rate. The initial taste was of tart green fruitiness, slightly reminiscent of the sauvignon blanc I had a few weeks ago, and which was very surprising coming from a deep purple-red wine like this. The spiciness of the shiraz kicked in after a while, but it was restrained in strength, and always mixed with that surprising tartness. The typical peppery flavour was either absent or only at a very low level. There was a hint of dark plum. All together, an eye-opening blend. 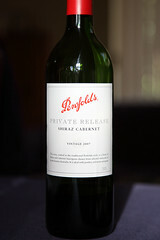 It was complex with layered flavours and very enjoyable.